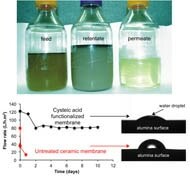 According to Researchers at the Energy Safety Research Institute at Swansea University in partnership with Researchers at Rice University, a new superhydrophilic filter has exhibited the ability to remove greater than 90% of hydrocarbons, as well as all bacteria and particulates from contaminated water produced by hydraulic fracturing (fracking) operations at shale oil and gas wells. The research by Professor Andrew R Barron and his colleagues converts a ceramic membrane with microscale pores into a superhydrophilic filter that "essentially eliminates" the widespread issue of fouling. The Researchers established one pass through the membrane should clean contaminated water sufficiently for reuse at a well, considerably cutting the quantity that has to be stored or transported. The research is published in Nature's open-access Scientific Reports. The filters keep emulsified hydrocarbons from passing through the material's ionically charged pores, which are around one-fifth of a micron wide, small enough that other contaminants cannot pass through. The charge attracts a thin layer of water that adheres to the whole surface of the filter to repel globules of oil and other hydrocarbons and prevent it from clogging. A hydraulically fractured well uses over 5 million gallons of water on average, of which just 10 to 15% is recovered during the flow back stage, Barron said. This makes it very important to be able to re-use this water. Not every type of filter reliably eliminates every type of contaminant, he said. Solubilized hydrocarbon molecules slip straight through micro filters created to remove bacteria. Natural organic matter, like sugars from guar gum used to make fracking fluids more viscous, require ultra- or nanofiltration, but those foul easily, particularly from hydrocarbons that emulsify into globules. A multistage filter that could remove all the contaminants is not practical because of cost and the energy it would consume. Frac water and produced waters represent a great challenge on a technical level. If you use a membrane with pores small enough to separate they foul, and this renders the membrane ineffective. In the research, the superhydrophilic treatment results in a greater flux (flow) of water through the membrane as well as hindering any hydrophobic material – such as oil – from passing through. The difference in solubility of the contaminants thus functions to allow for division of molecules that should in theory pass through the membrane. Barron and his colleagues used cysteic acid to alter the surface of an alumina-based ceramic membrane, rendering it superhydrophilic, or very attracted to water. The superhydrophilic surface possesses a contact angle of five degrees. The acid covered not only the surface but also the inner side of the pores, and that kept particulates from sticking to them and fouling the filter. In tests with fracking flow back or produced water that contained guar gum, the alumna membrane exhibited a slow initial decrease in flux - a measure of the flow of mass through a material - but it stabilized for the period of lab tests. Untreated membranes revealed a remarkable decrease within 18 hours. The Researchers hypothesized the preliminary decrease in flow through the ceramics was because of purging of air from the pores, after which the superhydrophilic pores trapped the thin layer of water that prevented fouling. This membrane doesn't foul, so it lasts. It requires lower operating pressures, so you need a smaller pump that consumes less electricity. And that's all better for the environment. Rice alumnus Samuel Maguire-Boyle is the paper’s Lead Author. Co-authors are Rice alumnus Joseph Huseman; Graduate Student Thomas Ainscough at Swansea University, Wales; and Abdullah Alabdulkarem, of the Mechanical Engineering Department, and Sattam Fahad Al-Mojil, an Assistant Professor and Environmental Adviser, at King Saud University, Riyadh, Saudi Arabia. Barron is the Sêr Cymru Chair of Low Carbon Energy and Environment at Swansea and the Charles W. Duncan Jr.–Welch Professor of Chemistry and a Professor of Materials Science and Nanoengineering at Rice. The study was supported by the Welsh Government Sêr Cymru Program, FLEXIS, which is partially funded by the European Regional Development Fund, and the Robert A. Welch Foundation.